Former African club title winners Gor Mahia of Kenya and Power Dynamos of Zambia face fights for survival in Confederation Cup preliminary ties this weekend. Gor Mahia, winners of the now defunct African Cup Winners Cup in 1987, are away to ANSE Reunion of the Seychelles having been held 0-0 at home while 1991 Cup Winners Cup holders Power Dynamos take a 1-0 lead over Recreativo Caala to Angola. The Kenyans were expected to build a commanding first-leg lead in Nairobi two weeks ago only to flop and finish with 10 men after star midfielder Teddy Akuma was sent off. Croat coach Zdravko Logarusic accepted some blame for the outcome, but remains confident Gor Mahia will pull through on the Indian Ocean island and secure a last-32 showdown with ENPPI of Egypt. "Our preparations were not good enough and there was too much pressure on the team to score goals - everyone assumed our opponents would offer little resistance," he told reporters. "We were a disjointed lot and far too nervous when close to goal. There were a lot of scoring opportunities for us and the boys appeared to be struck by the jitters whenever they had an opportunity." Gor can draw some comfort from the showing of compatriots Tusker in Victoria two weeks ago as the Kenyans came from behind to rout Saint Michel United 4-1 in a Champions League tie. But less encouraging is their record in the second-tier Confederation of African Football club competition with home and away losses to APR of Rwanda and Ferroviario Maputo of Mozambique in previous appearances, and no goals from five matches. Confederation Cup debutants Power Dynamos want to avoid the fate of fellow Zambians Red Arrows, who were bundled out in the preliminary round last year by unfancied Royal Leopard of Swaziland. Graven Chitalu headed the first-leg match-winner on 70 minutes as the home team struggled to overcome pre-season rustiness against the defensive-minded Angolans. Power Dynamos coach Beston Chambeshi is pinning his hopes of survival on 2012 Zambia Footballer of the Year Mukuka Mulenga, a young midfielder who played in the 2013 Africa Cup of Nations in South Africa. "I am expecting a lot from him in Angola," said Chambeshi. "And I hope he will continue where he left off in a Charity Shield victory over Zesco United last weekend." 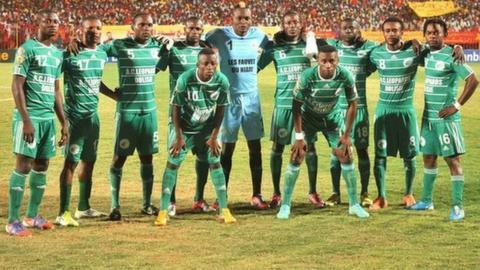 Caala coach Ricardo Formosinho is upbeat: "We were without some of our best players in Zambia. Our emphasis will switch to attack in the second leg and I'm hopeful of overall victory." Another club travelling with a 1-0 advantage are African rookies New Edubiase United of Ghana, who confront regular international campaigners Diables Noirs of Congo in Brazzaville. Although the clubs with the best African records receive byes into the round of 32, the last three Confederation Cup winners - FUS Rabat and Moghreb Fes of Morocco and AC Leopards of Congo - played in the preliminaries.